TravelSkite: Patmos: island of mysteries. Just not that one. Today's cliché moment was randomly exploring a steep narrow pathway back from the waterfront at Patmos, and hearing, invisible on a roof terrace above me, an old man playing the balalaika, singing along to it, and encouraging his little granddaughter, Ella, to sing with him. 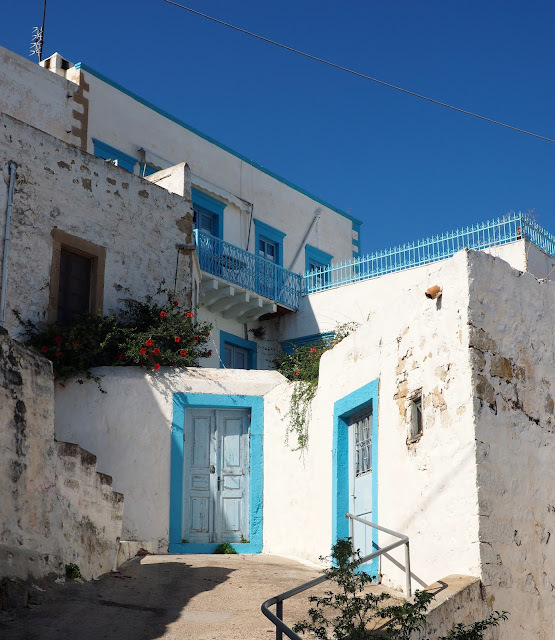 It was tuneful and charming, and so very Greek - what with the white-painted buildings, the blue doors and window frames, the purple bougainvillea and all. 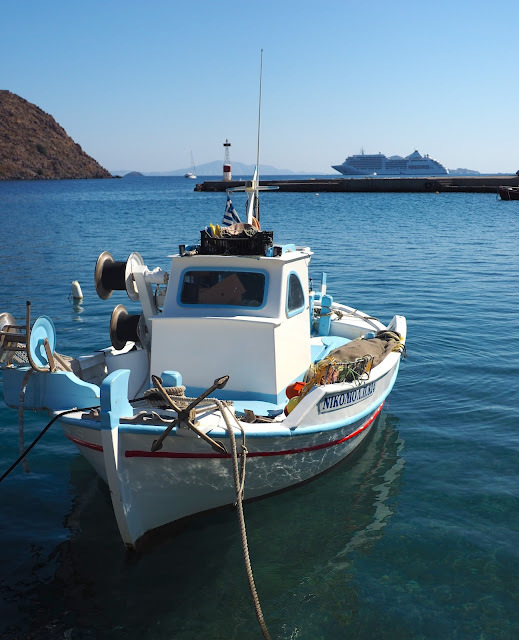 Patmos is the most northerly of the Dodecanese island group, and relatively untouristy - or as much as possible, given that St John had a vision in a cave here, and dictated his Book of Revelation on the island; so of course it's on the pilgrim trail. The day's greatest mystery, however, was observing an old man at the end of a pier continuously sweeping his arm back and forth, holding a line tied to an octopus. He did it for ages, never stopping while I watched, and I have no idea why. Slowly beating the poor thing to death on the concrete step? Tenderising it after death and before consumption? Playing puppet-master? I'll probably never know; and that's ok by me. I have faith that there will be a practical explanation.